The design was developed at Factory No. 92 by engineers V.A. Ganin and A.S. Chasovnikov. The new tank was intended as an upgraded version of the unsatisfactory heavy tanks of that time. Existed only in blueprints. Even when fully upgraded, The ST-I is the slowest of all Tier 9 heavy tanks available, but it's slow for a reason. It has very sturdy angled armor that is impenetrable to many Tier 8 guns and is more than a challenge to penetrate when angled properly. A properly-driven ST-I can have confidence in its armor especially when hull-down or sidescraping. The ST-I weighs only about 58 tons, almost half the weight of its predecessor, the KV-4, and thus isn't as well-suited for ramming but in turn can reach and maintain surprising speeds when pushed along by teammates. Its top 122mm gun is very powerful, yet gun handling is poor, and gun should rarely be fired on the move. Long range shots will require careful aiming. In the hands of a player who has mastered close to mid range combat, this tank can be a nasty surprise and is highly difficult for vehicles of the same and lower tier to penetrate. When top tier the ST-I can easily lead its team to victory as a sturdy breakthrough tank coupled with formidable firepower. Best turret of all the tier 9 heavy tanks, nigh impenetrable facing head on. Strong 140mm side armor allows for effective sidescraping. Great 122mm gun with high penetration and alpha. Stunningly fast rolling down slopes. Surprisingly good gun depression (-8) coupled with strong turret makes this tank a beast hull-down. High penetration guns can punch through the upper glacis with ease and lower glacis is a known weakspot. Devastating stock grind without IS-line progress (see Early Research Below). Much worse at ramming than the KV-4 due to lighter weight but is in turn much faster. Poor gun handling requires mid range or closer encounters. Slow speed and traverse creates significant vulnerability to flanking/circling. The ST-I is a very formidable heavy tank at tier 9 and can be considered one of the best in its class. Boasting armor rivaling that of the E-75 and an alpha-powerful 122mm gun, the ST-I is a powerhouse that cannot be considered lightly. Armor The ST-I has one of the best armor of the tier 9 heavy tanks. It has a massive turret that is almost immune head on, with the only weakspot being a strip of cupola which is both tiny and well-armored. This makes the ST-I's turret one of the best in the game, even better than the turrets of American heavies. Coupled with its surprisingly good gun depression for a Russian tank, the ST-I can effectively use hull-down tactics that would render it nigh-impenetrable to all but the most powerful guns. For the hull, it is a much more different story. While the ST-I has thinner but more sloped armor than the KV-4, the frontal lower plate is a well-know weakspot which can be easily penetrated head on and even when angled. It is therefore imperative to hide the lower glacis as much as possible. However, if The ST-I is able to use its strong side armor to sidescrape, then it can be rendered impervious to even the JPZ E-100. Due to such qualities, an ST-I with backup can stall an entire flank for extended periods of time, by baiting shots and eating them, while returning penetrating shots of its own. In fact, it is not uncommon for games with damage in excess of 3000+ to happen when placed in such a favorable scenario. Gun The gun of the ST-I is typical of russian tanks, high alpha, slow reload and poor gun handling. With an accuracy of 0.38m, its gun can still be used for long ranged fights, yet the poor aimtime of 3.4 secs limits its capability. On city maps and in close quarters however, the strong alpha of the 122mm gun makes peek-a-boom tactics very viable, while negating its flawed accuracy due to the close range. As such, the gun is most useful in city maps and when facing slow enemies in close range. Mobility The one of the drawbacks of the ST-I, the ST-I is the slowest of the tier 9 heavy tanks due to its underpowered engine. on flat ground, it averages at 27km/h and 20km/h crawling up slopes. This can severely limit the fighting capability of the ST-I when relocating as the slow speed makes it hard to get to useful positions in time. However, when rolling down a slope or when pushed by allies, the ST-I can reach the top speed of 40km/h, which can surprise many an enemy. In addition to its slow speed, the slow traverse also makes the ST-I highly vulnerable to medium tanks. Usually, any medium that gets around the ST-I is usually going to be able to either kill it or cripple it severely before allies come to help or the ST-I finally catches up with the medium tank. A completely stock ST-I might be one of the worst tanks in Blitz. Owners should NOT drive this tank without the turret and at LEAST the BL-9 gun. The stock turret can be penetrated by nearly any weapon an ST-I will face. Furthermore the stock D-25T has nowhere near enough penetration to compete with tier VIII and up vehicles. It is HIGHLY recommended that ST-I drivers first proceed up the IS line and unlock the BL-9 via IS-3 at the very least. The top M62 gun is also shared between IS-8 and ST-I and can be unlocked with either first. The designer of this machine is Valentine Asikritovich Ganin. This man had the experience nebezyvestnom factory "Bolshevik," and from 1942 to 1945 - senior engineer of the Central Artillery Design Bureau Plant № 92 (Grabin KB). However, the more he is known as a rocketeer, in particular, to him belongs the idea of an underwater missile launch. Went to Ganina owns a total of 62 work in the field artillery, aviation, rocketry, including 24 copyright certificates. In short, people are very uneasy. Draft tank PT-I is not bad, had a number of original solutions, first applied in tank. But man does not have CB on his back and, more importantly, influential people. Plus, the tankers do not like the gunners. In general, the project zapinali and deposited in the archives, where it is stored until now. Assistant in this project was made by a young engineer went to Ganina CHasovnikov, a graduate Baumanki. On his account just not a few inventions and achievements. Comrade Valentine Asikritovich was an outstanding designer. 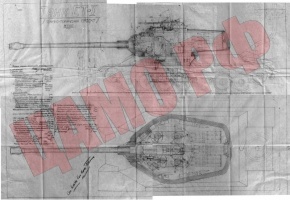 Ganin with Chasovnikovym widow created a project of the tank, at what their work was based solely on their enthusiasm and dedication - the order for the design of this tank is from the state was not. To be honest, most of the best weapons, created in Russia (do not know about other countries), it was invented by designers-enthusiasts. Notable examples of domestic and foreign heavy tanks have a number of serious shortcomings in the device of the crew compartment, undercarriage, etc., which reduce their military value. As the gun and fighting compartment 1) Lack of quick-firing gun at medium and large caliber. 2) Lack of gun and turret stabilization, which is very difficult to shoot on the move the tank. 3) Small ammunition shells for the gun, which reduces the value of a combat tank. 4) The existing artillery systems medium and large caliber could hardly be placed in the limited dimensions of the turret. 5) The possibility of increasing the initial velocity armor-piercing shells at the same weight of projectile charge and size and save the gun was removed. 6) The location with respect to the tank commander and gunner guns has drawbacks in existing tanks as then: the swing of the gun, gun recoil, the fall of spent cartridges and use the loader in the loading process - all this nervous commander, distracting him from the battlefield observation. Relatively limited to an overview of the tank in front. 7) Set the gun in the turret complex technologically and structurally little benefit. 8) In the presence of anti-aircraft machine gun impossible to fire on the simultaneous ground and air enemy. 9) is not completely solved the problem of reliability of the Ventilation of the crew compartment of the powder gases which is especially important when powerful quick-firing gun. 10) In many tanks there is no leg drive smoothly electorate (hydro) turret. Here is a list of izobtreteny and innovations that Ganin introduced to your project. 1) Triple medium or installation of guns of large caliber machine guns and two (small-caliber guns). 2) Placement of the tank crew: - the driver - in the nose of the tank, - the commander and gunner - in front of the towers - two charging - behind the commander and gunner. This the location of the tank commander gives him the best view and most tranquil location. presence of two significantly increases the rate of charging of the tank gun. 3) In a pocket niche tower in the direction of loading is quick-boeukladki (constructively, as a special case of cellular) rounds for the gun. At the same time such an arrangement is possible, as for unitary rounds and for rounds of separate loading (installing tandem with the banana). This eliminates unnecessary movement when charging the gun, which also dramatically increases its rate of fire. 4) The fence is located gilzootvoda gun centering chuck, spring-loaded rocker roller, reduces the size of loading the gun and raising its rate of fire. 5) To increase the initial velocity armor-piercing projectile gun under the previous weight of the projectile charge and constant dimensions of the guns used a special long-range nozzle tip. 6) In order to stabilize the gun in the vertical plane of fire, providing marksmanship with a stroke, used a special hoist to stabilization of mobile gun system gun mount. 7) To create a foreign exchange stabilization of the turret that provides the shooting accuracy with the progress of the tank, applied on the horizon a rotary mechanism to stabilization of the tower. 8) For self-defense against aircraft, in the hatch of a loader installed polubronirovanny heavy machine gun (small-caliber gun), with a special swivel shoulder-, improving tip-off. At a time when a charging of the firing anti-aircraft machine gun, the rest of the crew continues to work his usual combat (the commander oversees the battlefield, the second charging charges the gun, the gunner firing at ground targets). The construction proposed by the author, carried out in the sample. 9) To provide a convenient foot drive of the horizontal electric (hydro) used a special turret with a swinging footrest manually-foot lever. 10) Elektropovorot turret is provided to implement the scheme Ward or Leonardo Ampledin. Duplication of the drive control tower elektropovorota displayed to the commander of a tank for the rendition of the tower, or when you specify the target. 11) the most advantageous technologically and structurally setting the gun in the turret, is achieved by using box-like frame, which is installed on the gun cradle trunnions. The processed frame is welded to the tower. This eliminates the handling of the installation of the gun inside the tower, possible biases, etc. 12) For the application of flue minutes to hide the tank or the ejection of frag mines against infantry set breech-loading mortar. In a mortar tube from the rocket tank commander gives signals flares. 13) are three hatches: the commander of his commander's cupola and both charging that facilitates rapid recovery of the crew of the tank and the tank commander's convenience during normal maintenance of anti-aircraft machine gun. 14) You installation of freely rotating commander's hatch, while flipping the stabilization of the tower to the target (obrabatyvanie angle.) 15) Sights: - guns - cracking monocular scope with variable magnification and a variable field of view (TS) - anti-aircraft machine gun - and the sighting collimator sight (mostly to calibrate the collimator.) 16) To the best of the crew compartment ventilation from powder gases, suction applied to the local gas of spent cartridges flying out of the breech, through the pipe fence gilzootvoda (performed with the holes) with the suction fan. 17) for ventilation the crew compartment is a fan-type blower, located above the gun. 18) Air supply units of the consumer in the tower provides a special case of the engine through the air VU. 19) The commander has a rotating seat with backrest and footrest special. 20) Sitting suspended charging plug . 21) Most of the combat pack is a rapid-tank and is located in the tower. 22) Ambrazurny site provides the best armor protection frontal part of the tower, the most advantageous technology and ease of making your reservation, allows a reliable seal against water, vapor CQ bullets. 23) to seal the skirt of the tower and the shielding barrel gun and swinging bookings are inflatable tubes that are located in special grooves. 24) In order to ensure circulation of the underwater tank, the suction pipe is provided for a flexible hose to the engine swinging a float tube or patched. Exhaust can be made ​​directly into the water or the patched tube into the atmosphere. When the exhaust into the water it is desirable to use slotted hangers. 25) for walking underwater tank, inside it expected to increase the air pressure to prevent infiltration of water through accidental leaks. 26) For seizure of the gun turret hatch is in an alcove of the tower. 27) Applied road wheels Large diameter, with them lying on the tracks and lifted the axles and idler drive wheel that provides greater survivability of the chassis and the best of its dynamic qualities. As you can see, innovation is not enough. First of all, emphasis was placed on increasing the firepower of the tank and improve the review of the car. As the chassis was used by a tank shell object 701. Object 701 - IP-4 is an earlier version. Differed from the final design of the suspension and transmission, and, consequently, had a large diameter rollers, without oporonyh rollers. How many people know, the tower tank ST-I, very much like an American. But in fact this is a purely authoring Ganina - U.S. T29/T30/T34 with their brutal towers were created independently of amerkantsami Ganina. Due to these innovations was to get the tank at the time unprecedented firepower. Here in brief the most important: The introduction of the vertical stabilizer of the gun and the mechanism of the horizontal stabilization of the tower (!) Was to qualitatively improve the accuracy of shooting, especially with the move. The use of a special device (distant nozzle tip) allowed up to 12-20% armor penetration of all guns in the arsenal of available time. But it had one drawback - because of increased so skorsoti flight of the projectile (security armor penetration) significantly reduce the life of the barrel. Appearance of the second charging, rabotyuschih together on both sides of the gun breech, as well as the removal of combat pack in the back of the niche spetsialntsyu tower (as in today's NATO membership tanks) has significantly raise the rate of gun. The increase in working space, the introduction of powerful ventilation crew compartment, improving the working conditions of the commander (rotating commander's cupola and an armchair commander, electromechanical device turret) allows a qualitatively improve the efficiency of the crew. ST-I Heavy Tank at wikipedia.org in Russian, use Google translate. This page was last modified on 8 October 2016, at 10:40.